I spent about half an hour gazing at the Sphinx that’s a part of the British Musuem’s internationally touring “The Body Beautiful in Ancient Greece” exhibition now at the Dallas Museum of Art (through October 6, 2013). I had seen the exhibit a few weeks ago and dutifully read all the descriptions and spent time with each piece, as I like to do. 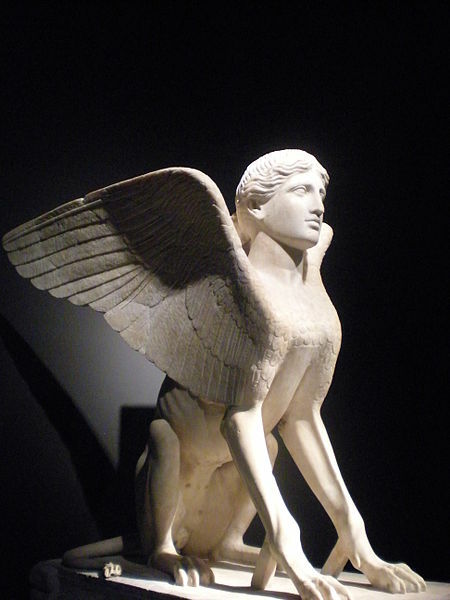 But when I awoke one day this week, one of the pieces was calling me back to spend more time with her—The Sphinx. This marble Sphinx was at one time—it’s believed—to be a table, and from a distance just beyond the rope and under the watchful gaze of people seen and unseen, I feasted on her magnificence. Since I had been summoned by her, I approached without fear. As I circumambulated her curious body and sought out her secrets, I let the light reveal to me the perfect angles at which to stand to see all the places I missed at my first viewing. The back of her neck where it connects the loose bun of her hair would have been lost to me had I not taken the time to look for it. I love her lion’s body and the claws (part of one toe missing) and the hidden tunnel under her rump and tail. The joints of her hind legs have a beautiful bend where our human knees would be. Judging by her nippled underbelly, this Sphinx may have sublimely terrible cubs (eaglets? babies?) somewhere nearby. And, ah, her eagle wings. I considered counting her feathers, making note of the layers of each. But instead I imagined how thrilling it would be to run at great speeds and ferocity like a lion then suddenly at will to lift up onto the winds. Could she fly as high as an eagle? Could she see the curvature of the earth? Could she soar above the clouds and storms? From her great height, could she behold a morsel of food (mouse, bunny, me) on the ground below? No one could answer my questions, so I faced her head on with hope that I could hear the voice of the one who had called me there. I looked into her eyes—their paint long lost—and tried to hear her riddles. Would I know the answers to her questions? Would I survive our meeting if breath filled her lungs? I tried speaking with the artist who made her over two thousand years ago, in case there’s something left of him in the ether to be heard and known. I wanted to ask him about the choice he made of giving her lopsided hair. I imagined this explanation: “If it’s too perfect, too symmetrical, it would seem like a lie, an impossibility, a Myth. I wanted her to seem real, perfectly-imperfectly real.” Then the thought came: it was the artist who was imperfect and unable to achieve symmetry in his attempt to create the waves of a woman’s hair in marble. I have these same problems with my own hair with which I have spent decades, so I am sympathetic to his challenge. I heard the artist’s voice again. “It’s just a table,” he laughed. But still, I wish I had brought a flashlight and binoculars so I could examine her shadowed places. What did I miss that I could not see? The Sphinx keeps so many secrets, standing guard at the gates of graves. I walked and paused, walked and paused around her to find new things each time round. And as I got to know her better, I noticed my own limbs changing, becoming Sphinx-like. I prowled around her with these lion legs of mine; I fluttered my eagle wings and felt a little lift. But did I dare even try to fly? Certainly, it would be too much of a shock for the ones watching me on monitors and quietly in corner of the room. Nonchalantly I walked, pretending to still be human. My belly rumbled, craving all the stories of all the Sphinxes (Sphinges, if you prefer) throughout all time. Not just the Grecian ones but the Egyptian, the Asian. Ones I have never heard of nor seen. “What have people said about her over time? What will they say?” I wondered. Oh, Sphinx. Where have you been all of your life? Where were you 570 A.D., in 1066, and during the World Wars? Who else has gazed into your eyes and pondered your sinew and mysteries? How many places have you hidden, hungrily composing riddles in the dark? Where were you the day I was born? And all the times I needed you the most? I try to adjust my thinking to the thought of you, the strange shape of what you are. I behold you, and I hold you in my being. When I came here today, answering your call, I only knew your name and a rumor of you, but I leave you a sister Sphinx of flesh, pondering the structure of questions and how devastating they can be. Yet I walk away preferring questions that serve a different purpose; riddles that act more as flashlights and binoculars. Before I left the side of the Sphinx, I looked again into her eyes and silently supplicated to ART. And when I no longer cared who was looking, I bowed.